Blood Assurance, which has a donor center in Fort Oglethorpe, is in critical need of blood donations. There is currently a blood shortage and a recent trauma has further exhausted the blood supply. "We are experiencing a critical need at this time," said Dr. Elizabeth Culler, medical director at Blood Assurance. There was a trauma at an area hospital last week that used most of the A+ supply. Blood Assurance has been in urgent need for 2 weeks and has had several high usage patients. They are in need of A+, A-, B+, B-, O-, O+, and ABdonors NOW! "Because we are in critical need, we are asking healthy donors to please come replenish the supply," said Jay Baumgardner, director of community relations at Blood Assurance. "If you are able to donate, we ask that you take 30 minutes out of your day to save lives in your community." The Fort Oglethorpe Blood Assurance donation center is at 2720 Lafayette Road, next to Sear's Shoe Store near the Battlefield Entrance. Hours for donations are Mon.-Fri. 9:30 a.m.-6:00 p.m. and Sat. 9 a.m.- 1 p.m. The local center's phone number is (706) 861-5983. Each donation of blood contains plasma, red blood cells and platelets that can be used to save up to three lives. Patients undergoing surgery, receiving cancer treatment or organ transplants rely on donated blood, in addition to the unexpected traumas seen at hospitals on a daily basis. All blood used at hospitals is given by volunteer donors only. To be eligible to donate blood, you must be at least 18 years old (16 and 17 years old with parental consent), weigh 110 pounds or more and be in good health. Donors are asked to drink plenty of fluids — avoiding caffeine — and eat a meal that is rich in iron prior to donating. To schedule an appointment at a donor center or blood drive near you, please visit www.bloodassurance.org, call 800-962-0628 or text 'BAGIVE' to 444999. Blood Assurance is a nonprofit, full-service regional blood center serving 51 counties and more than 76 health care facilities in Tennessee, Georgia, Alabama, North Carolina and Virginia. Fairyland School may be small in size, but is filled to the brim with big, loving hearts. There have been a few successful food and toy drives lately in which Fairyland School as a whole has stepped up to the plate and supported the community in big ways. The student council led a food drive to support more than 15 families in the school with nonperishable groceries, plus eight boxes left over for the Chattanooga Area Food Bank. The Walker County Sheriff's Department does the Stocking Full of Love toy drive and 15 large boxes of new toys were collected. Thanks goes out to all the generous hearts of the Fairyland families, plus student council, Fairyland staff members and the Walker County Sheriff's Department for coordinating the means of giving. A few individual students have recently reached out to the community with causes dear to their hearts, yielding incredible results. Fourth-grader Lilly Landis contacted McKamey animal shelter, wanting to start a pet supply drive to help the animals have a merry Christmas. After writing a piece about it in the weekly fourth-grade Kaleidoscope newspaper, the school family rallied around her project and she was able to take a large wagonload of treats, food, toys and supplies to Mckamey over the break. Stirred to action by seeing children working when she'd go visit a family every year in Guatemala, third-grader Irie Johnson, with help of family and friends, started a GoFundMe project called "Irie Love," providing care packages for working children in Guatemala, containing a toothbrush, toothpaste, healthy snack and a stuffed animal. The initial goal on the GoFundMe page has been reached, and many kids will feel the blessing of her efforts and compassion. Way to go, Lilly and Irie! Enough can't be said about the giving, volunteering spirit thriving at Fairyland without mentioning the library helpers program. A long-standing opportunity for Fairyland fourth-and fifth-graders, students fill out a job application and help one recess every other week. Some of their activities include checking out younger students, helping them with book selection, iPad maintenance, book fair and Seuss Day preparations. From dressing up as pirates to checking out kindergarteners to rehearsing and pulling off fun announcements as Clifford during our book fair, these kids do it all eagerly. The librarian is beyond thankful for their invaluable help in countless ways. Other capacities that the older students serve at the school include but aren't limited to: safety patrol, student council, and weekly paper recycling. Every one of these means of service is priceless to the school family — thank you, students! Activities Director Nikisha Phillips (left) and CNA Tonya Spurlin were excited to give back to local law enforcement. At Ridgeland High School, Principal Karen Hughes, her staff and students treated their SRO, Bruce Coker, to lunch. Across the nation on Wednesday, Jan. 9, young and old alike took the initiative in showing their appreciation to the men and women who have chosen a profession that puts their lives on the line every day. Walker County was no exception, and community members showed their respect to local officers in a variety of ways. PruittHealth, a local nursing home in LaFayette, showed its appreciation by hosting a hot dog lunch for local officers. "We haven't had a large number show up, but the ones who did were very appreciative and seemed to enjoy the event" said Nikisha Phillips, the activities director. "There are good and bad people in every profession, and we're so lucky to have some of the best here in Walker County. We're hoping to do a similar type of event for firefighters as well as military personnel. We've considered teacher appreciation, but they work during the day, which makes that challenging." Another event for local officers took place at the Chickamauga Telephone Company. Officers mingled inside the building and the community was invited to come in, shake hands, and do a "meet and greet" with the local law enforcement. Several officers, as well as the sheriff, showed up, bringing coffee and donuts, and socializing with members of the community. "We've probably got about 110 on payroll at the Sheriff's Office" said Sheriff Wilson, "and about 160 overall." 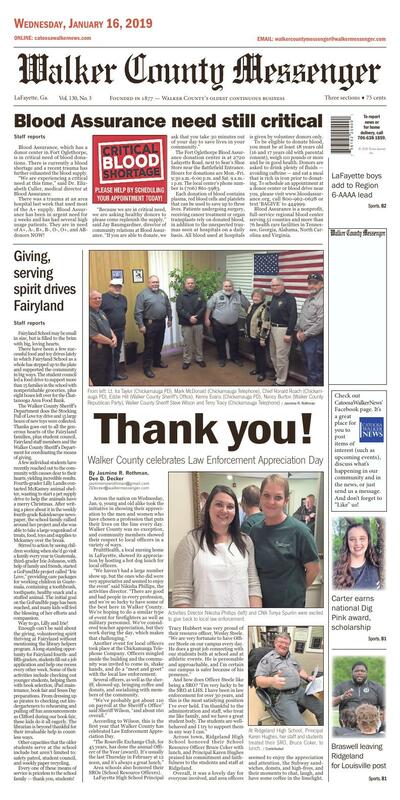 According to Wilson, this is the first year that Walker County has celebrated Law Enforcement Appreciation Day. "The Rossville Exchange Club, for 45 years, has done the annual Officer of the Year (award). It's usually the last Thursday in February at 12 noon, and it's always a great lunch." Area schools also honored their SROs (School Resource Officers). LaFayette High School Principal Tracy Hubbert was very proud of their resource officer, Wesley Steele. "We are very fortunate to have Officer Steele on our campus every day. He does a great job connecting with our students both at school and at athletic events. He is personable and approachable, and I'm certain our campus is safer because of his presence." And how does Officer Steele like being a SRO? "I'm very lucky to be the SRO at LHS. I have been in law enforcement for over 30 years, and this is the most satisfying position I've ever held. I'm thankful to the administration and staff, who treat me like family, and we have a great student body. The students are wellbehaved and I try to support them in any way I can." Across town, Ridgeland High School honored their School Resource Officer Bruce Coker with lunch, and Principal Karen Hughes praised his commitment and faithfulness to the students and staff at Ridgeland. Overall, it was a lovely day for everyone involved, and area officers seemed to enjoy the appreciation and attention, the Subway sandwiches, donuts, and high-fives, and their moments to chat, laugh, and have some coffee in the limelight.